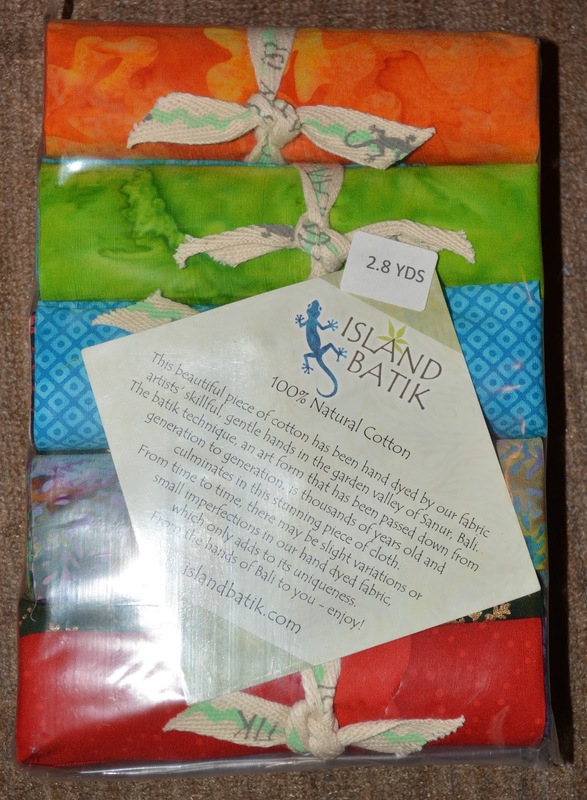 The products featured in this post were given to me by Island Batik. 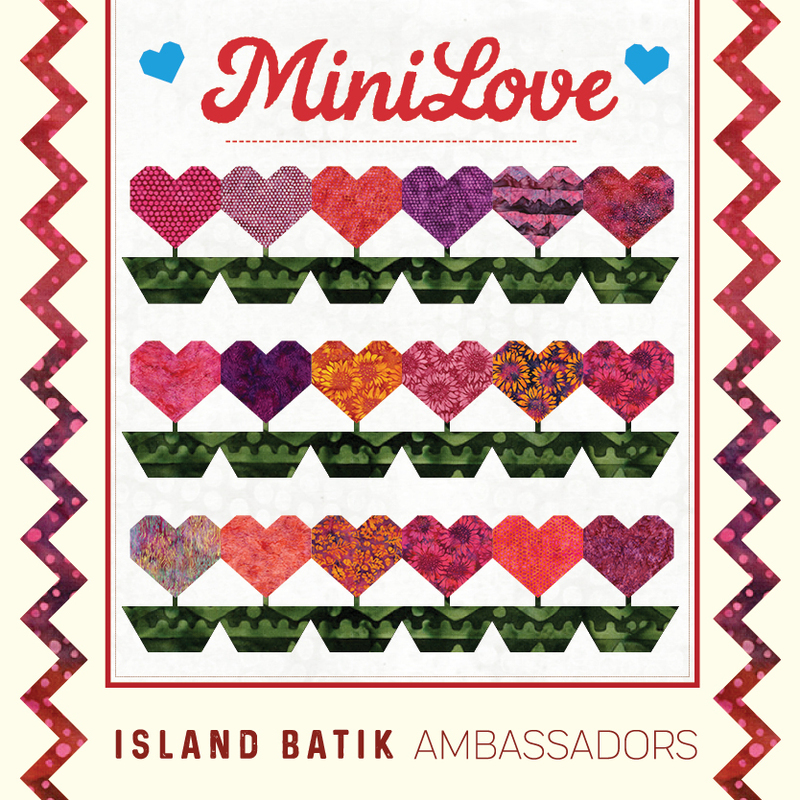 Each month, Island Batik Ambassadors are given a project, and this month the theme is "Mini Love". I *love* minis, so this is right up my alley! Here's another called "Teacher's Pet", which appeared in the "Miniature Wonders" column of Quick & Easy Quilting back in 2001. I hadn't as yet mastered machine quilting, as this one is hand-quilted. 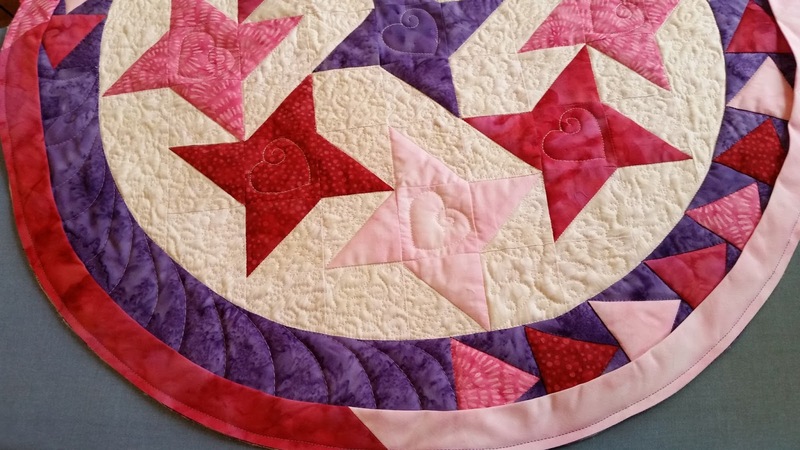 What I remember most about this quilt was that it was mailed back to me by the magazine early on Sept. 11/2001. 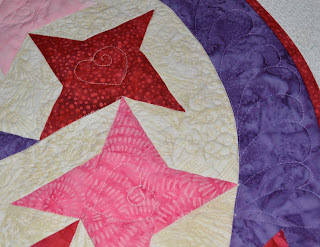 Because of the chaos of that day, the quilt went on a bit of a wild ride. When it finally arrived home a couple of months later, there were customs inspection stamps from all over the world, including Germany, France, and Scotland. 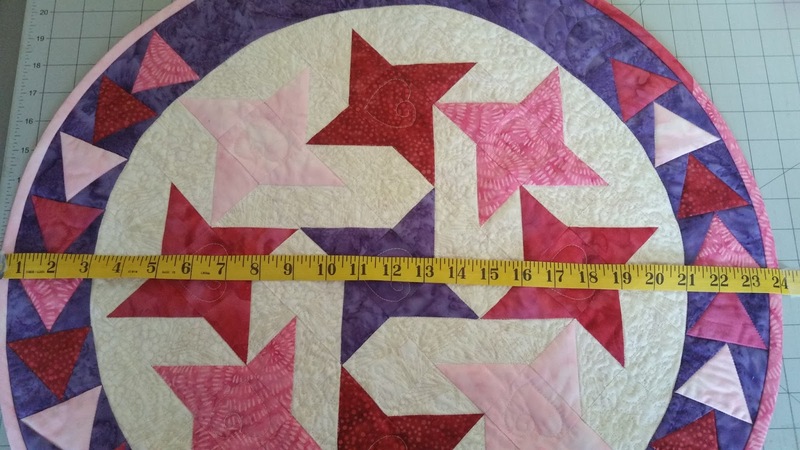 It finished at 12" square. One of my favourites is a miniature version of "Florentine" from my book Quilting Beauties, pieced from silk shirts purchased at Frenchy's. 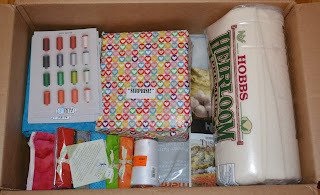 Last year, I signed up for the International Miniature Quilt Exchange, and that big reveal is coming up very soon. (next month, I think!) Please watch for that. 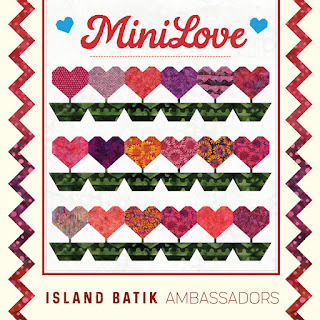 So...what to do for the batik mini-love challenge? I decided not to go too tiny on this one, and to use up a packet of red,pink, and white F.Q. 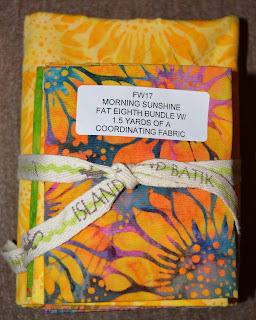 's, sent by Island Batik in my box of goodies. I added a bit of purple for good measure. Since it's February, the month of love, the Friendship Star block seemed a good choice. The block is pretty simple to make from HST's, and I set the stars to spin in a circle. These are 6" blocks. There are 9 stars in my friendship circle. 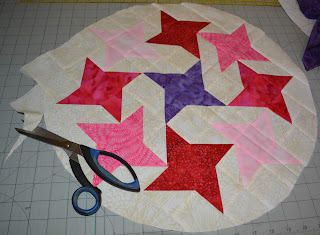 I traced a circle onto my patchwork with a disappearing marker, and cut it out with scissors. 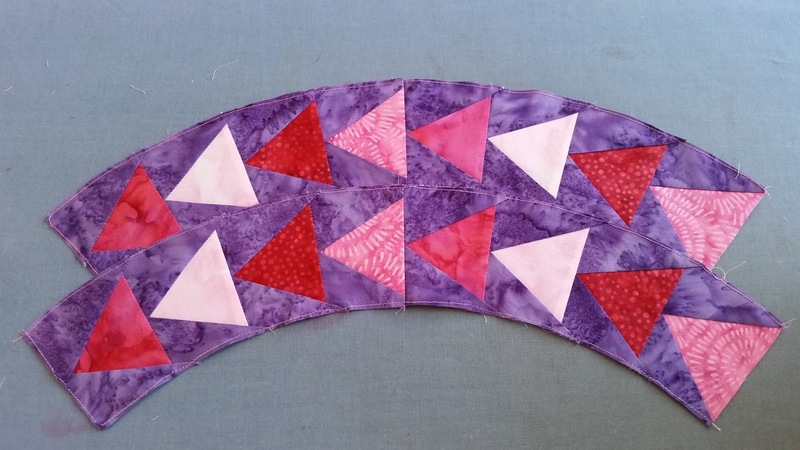 It needed something fun and colourful for the border. 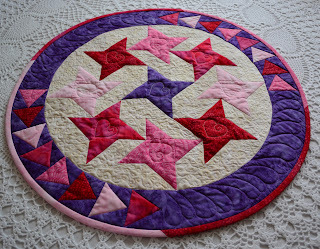 I went with the same purple used for the centre star, an Island Batik "Blender", in grape. For the batting, I chose a small piece of Hobbs Tuscany Silk. 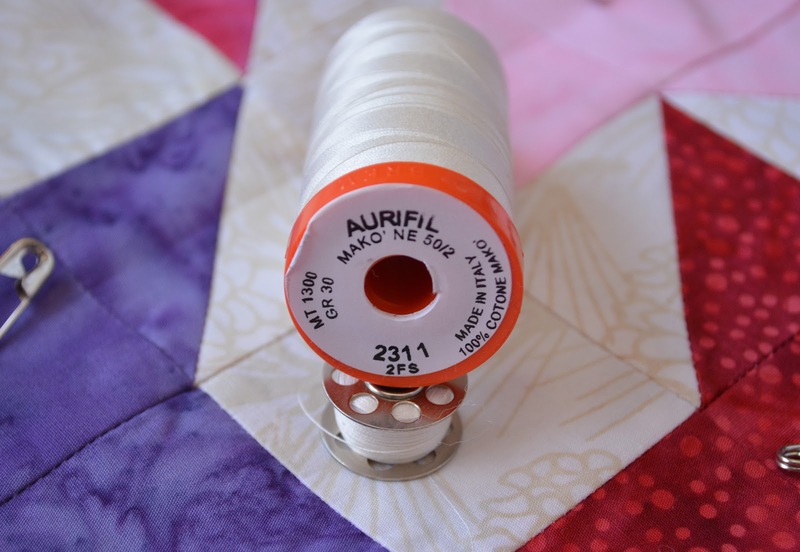 Aurifil 2311 was a perfect match to the background for quilting. I didn't want anything too serious, so the background is done in playful loops, a swirly heart added to each star, and a small feather up the plain sections of the border. 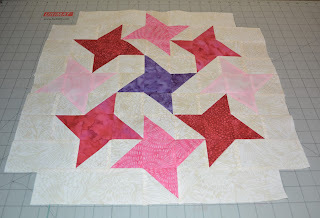 The bias binding was pieced using all of the pinks and reds from the stars. Don't you love binding circles? No corners to mitre! The project guidelines suggested no larger than 24", and it's bang on. 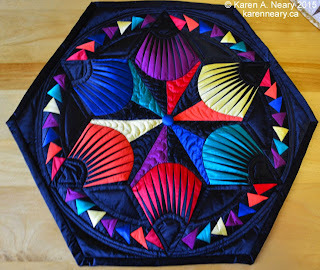 Technically, this is not a miniature quilt, it's more of a "small quilt". Projects will be posted by all the Ambassadors throughout the month of February. The links are all in my previous post, here. It's fun to see the theme interpreted so many different ways! Thank you to Laura at Slice of Pi Quilts for compiling this list! It's finally here - the big box of goodies from Island Batik! 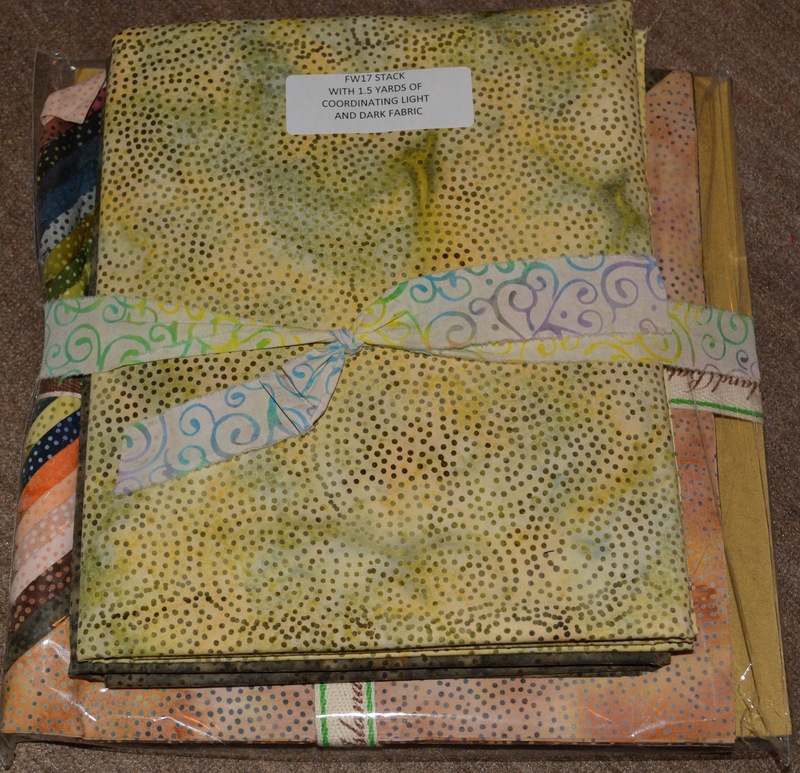 As one of their 2018 Ambassadors, I have been given the products featured in this post free of charge by Island Batik for use in my work. Since the company is based is California, it took a bit longer for my box to arrive than my U.S. counterparts. 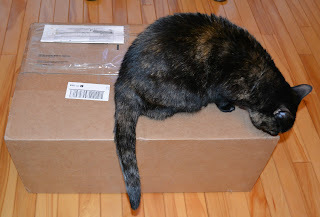 I have been drooling over their pictures since last week when their boxes began to arrive. I now get first-hand what all the excitement is about, as it's pretty amazing to open such a treasure chest. 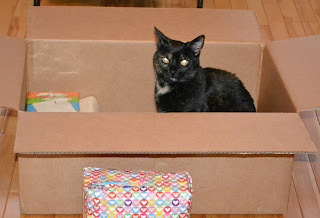 I got the email around 5:30 this morning that the box was out for delivery, so Polly and I were camped at the front door, waiting. It was very icy this morning and I held my breath in case that delivery man fell on his way in, but he made it safely! 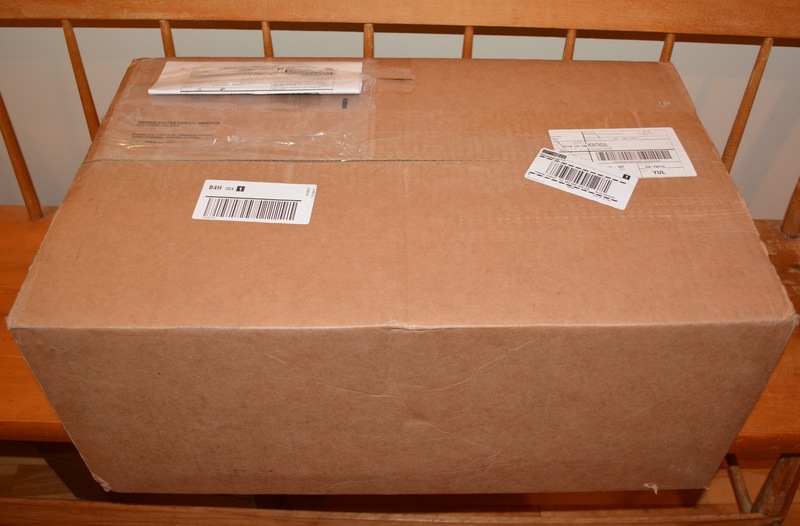 The first thing you notice is the big, wrapped parcel marked "surprise", and it will remain a surprise for now. 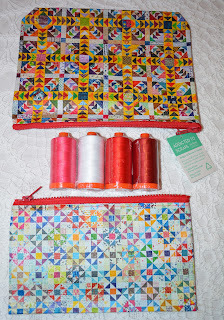 These are the new collections to be released at Spring Market and cannot be shown until then. ...and a group of F.Q. 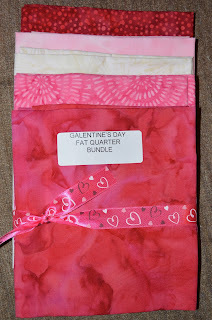 for a Galentine's Day project which, with the box's late arrival, has already passed. No worries, I have a project in mind which will be perfect for these. After snapping the first few photos, I wondered if I should stop and wait for better light. 6 am, on a winter day in Nova Scotia, isn't exactly the best time to take photographs, and I had all the lights on plus my flash. The thought went through my head that a little sun would be nice, and then I reached in and pulled out this bundle. Too funny!! Morning Sunshine, indeed. 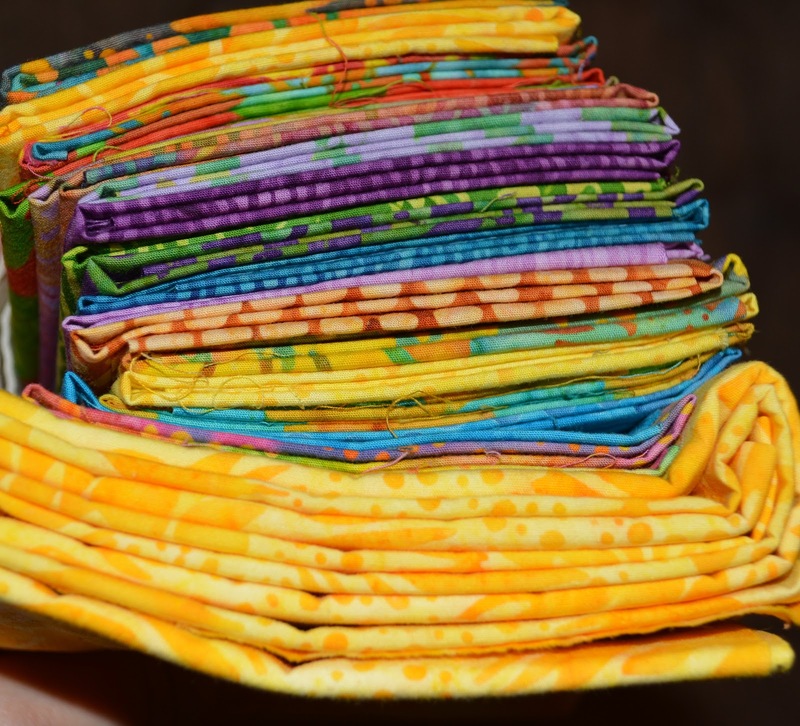 It's a beautiful bundle of fabrics in happy, sunny colours. This collection is in stores now. I love it! At this point, the Customs inspector was getting cheeky about letting me take anything more out of what was now her box. She's pretty territorial. I had to proceed carefully, because...well, she bites. 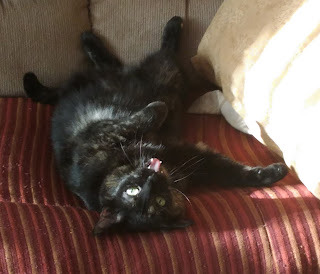 I had to get a bag of kitty treats out as distraction. Island Batik also print rayon batiks, and they sent this beautiful scarf and 2 yards of a to-die-for peacock blue. The scarf looks purple in this picture, but it's really a rich dark burgundy. 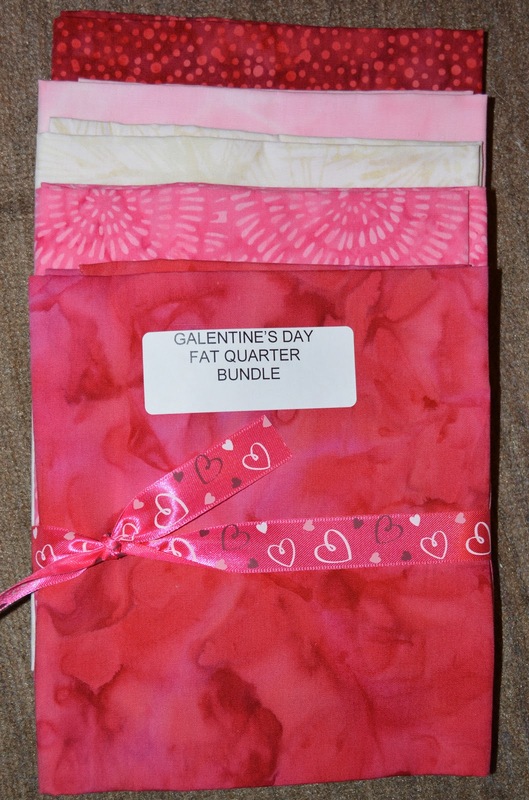 I have sewn lots with rayon in the past and look forward to making something from this. It drapes and washes beautifully. 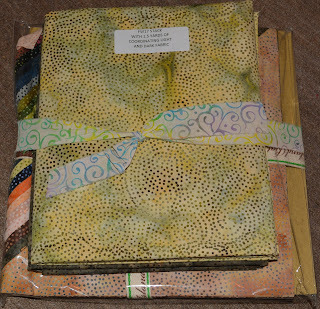 Here's a stack of "Paisley Dot", in earth tones, as well as coordinating yardage. 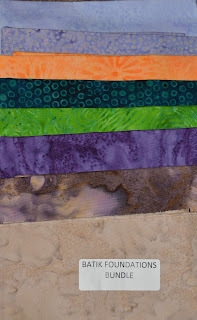 These rolls are called "Stash Builders" and they are 5" x WOF rolls which contain a variety of colours. Here they are on the side; lots of useful yardage here. We all know how I feel about Aurifil thread :) I ♥ Aurifil...and I am thrilled that they are an IB sponsor. They sent a 5,900m cone of 50 weight white, as well as 6 large spools of colours to coordinate with the fabrics in the box. The green spools are 40 weight, and the orange spools are 50 weight. 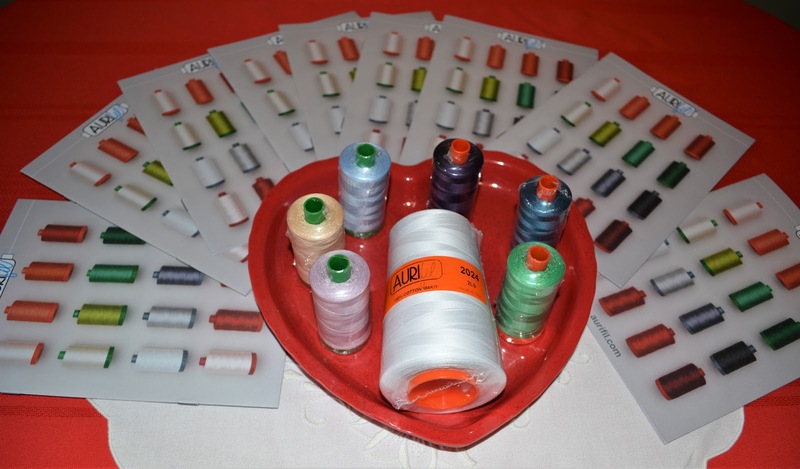 I am very pleased to receive some brochures, as I sell Aurifil thread and these will come in very handy with all the information they contain. You may also have spotted some batting in the box, supplied by Hobbs Bonded Fibres. I am certainly no stranger to Hobbs batting, and have used them for years. 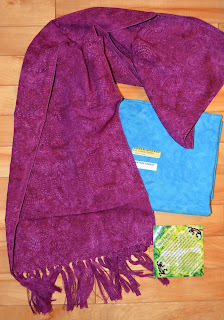 My two favourites are in the "Tuscany" line, the 100% wool, and the 100% silk - both are sheer delight to work with. Polly especially enjoys curling up to nap on the wool batting scraps. We can purchase these locally at Mrs Pugsley's Emporium. I am happy they sent along a sample card of their products. 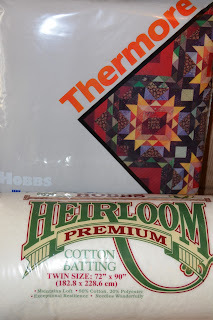 They also sent a cotton batt, and "Thermore", which I have not yet tried. 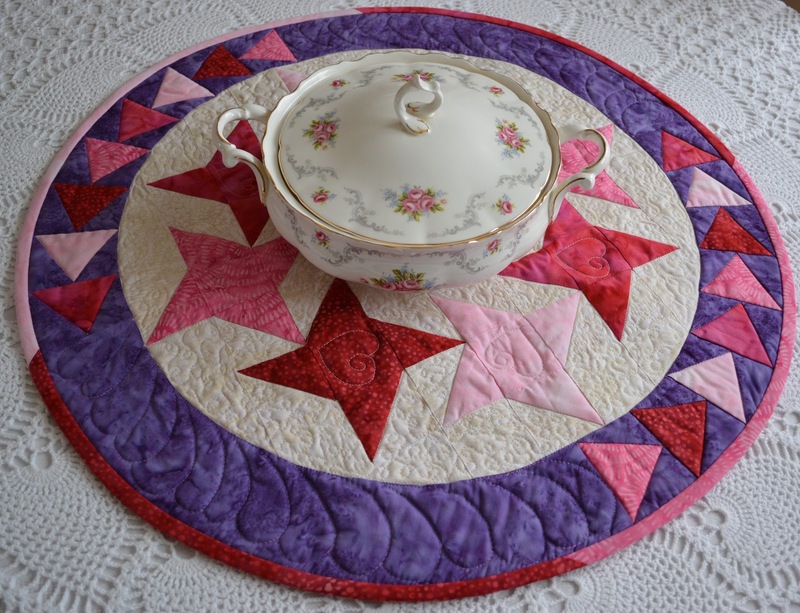 I suspect it will be wonderful in placemats and table toppers as it is quite thin. 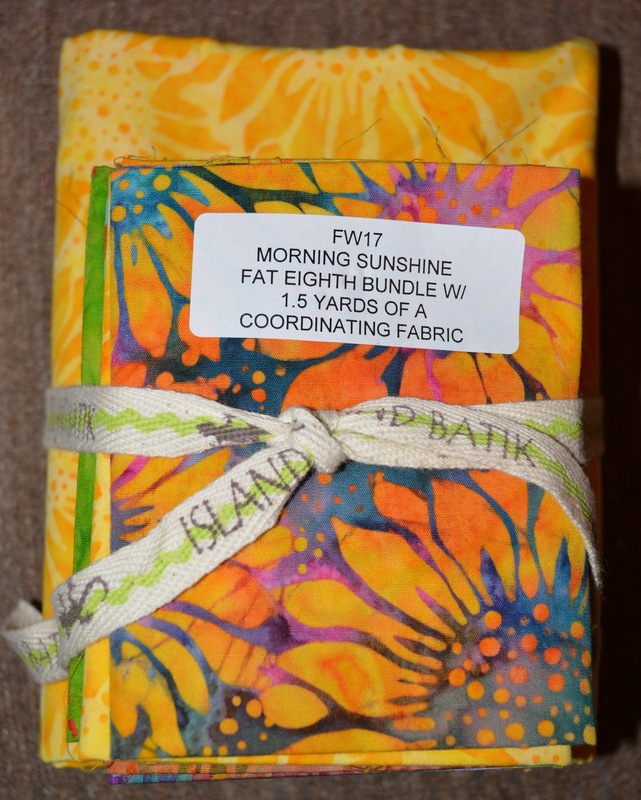 Thank you, Island Batik, Hobbs, and Aurifil, for this wonderful opportunity. 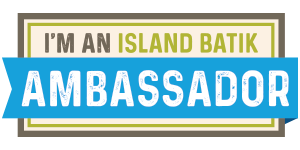 Early in this new year, I received the exciting news that I had been selected as an Island Batik Ambassador for 2018. 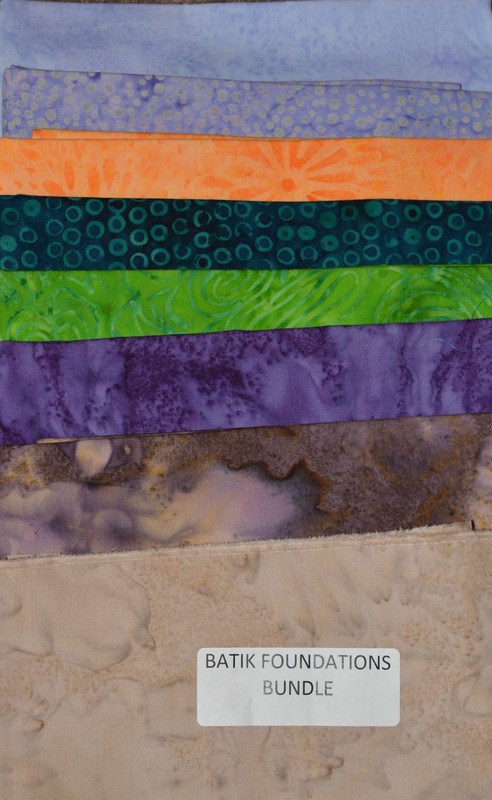 When I told friends and family, they all had the same reaction: "Wonderful...but I didn't know they made batiks on the Island!" To a Maritimer, anything "island" refers to Prince Edward Island - like Island Chocolates, or Island Distillers, or the popular Island Beach chain of shops. You can see how close P.E.I. is to Amherst, just across the Confederation Bridge. 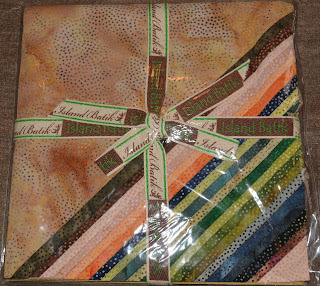 Island Batiks, however,are from an island almost half way around the globe. 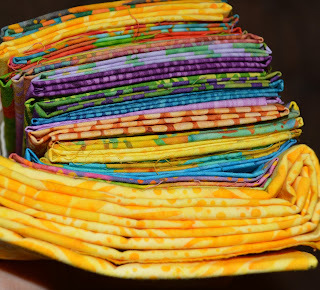 The fabrics are produced on the island of Bali, world famous for the manufacture of beautiful batiks. 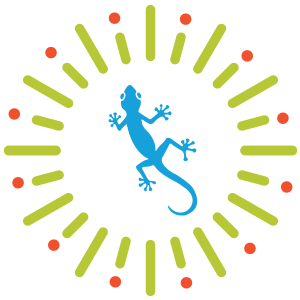 Island Batik provides employment for approximately 100 people on the island. The art of batik, a wax-resist dying method, has been practiced for centuries in Indonesia. 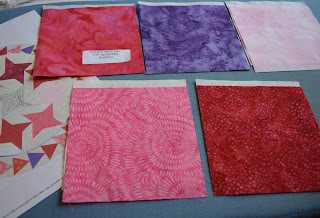 Starting with plain, white fabric, dyes are then added to create stunning and unique designs. The fabric is spread outside in the sun to dry - much like the way we dry our dulse. Each piece of fabric is custom designed, and every yard made by hand. It's a very labour intensive process. Island Batik is headquartered in Carlsbad, California, and have been in business for around 15 years. They have approximately 4 dozen ambassadors around the world, in places like Norway, Australia, the US, Canada, Greece and the UK. I applaud Island Batik for making this a global program. As a newbie to the Ambassador program, I will learn the ropes as I go. Each ambassador receives product from the company for use in their work, and there are monthly events to showcase the fabric. This year, Aurifil and Hobbs Bonded Fibres are also on board as partner sponsors. The first boxes from Island Batik have shipped, and mine should be arriving this week. To say I am excited to see what's included is an understatement. 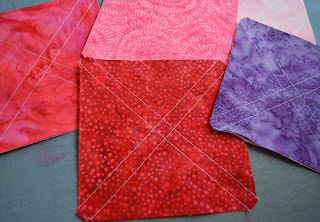 I look forward to spending lots of time in my sewing room, creating with this beautiful fabric. Thank you, Island Batik! 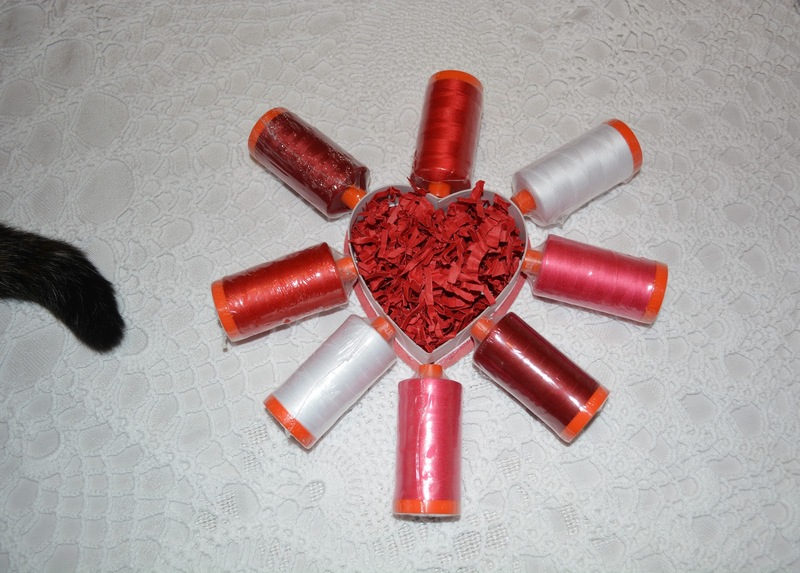 Here's a sweet deal on an in-house collection of Aurifil threads in Valentine colours. 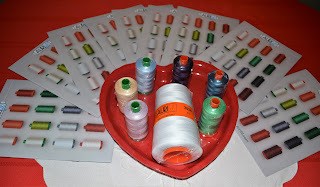 Four spools of large (1300 m) Aurifil cotton Mako 50 weight thread, in a zippered Eco pouch from Kansas City Star Quilts.. 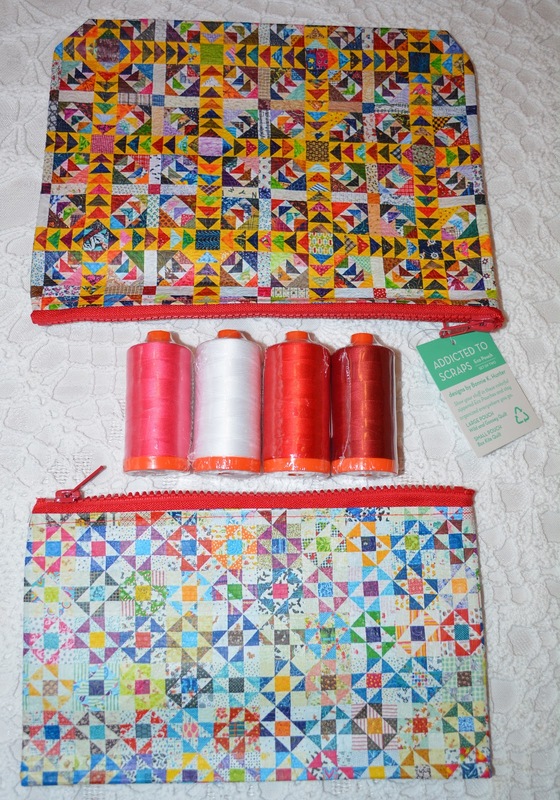 These Addicted To Scraps pouches are made of 100% recycled plastic water bottles, and are tough enough to handle even sharp quilting and sewing tools. The quilt designs featured are by Bonnie Hunter: Wild and Goosey quilt, and Box Kite quilt. The thread is priced at $13.00/spool, the pouch is includes free of charge. $52.00 is a pretty sweet deal! Thread colours are: 1103 Burgundy, 2530 Blossom Pink, 2250 Red, and 2024 White. Click here to order, quantities are limited.